A South Derbyshire engineering specialist has built on the success of its partnership with the JCB Academy by appointing another apprentice. Charlie Warrington is the latest addition to the Carfulan Group, which is based at its Advanced Innovation Centre in Foston and aims to give its apprentices a unique insight into the world-leading technology it supplies to designers and manufacturers to enable them to make top-quality products. This is done across three divisions – OGP UK, SYS Systems and ZOLLER UK – and covers the supply and servicing of multi-sensor inspection equipment, 3D printing and tool pre-setting and measurement, as well as turned-part measurement solutions, for some of the world’s leading brands. 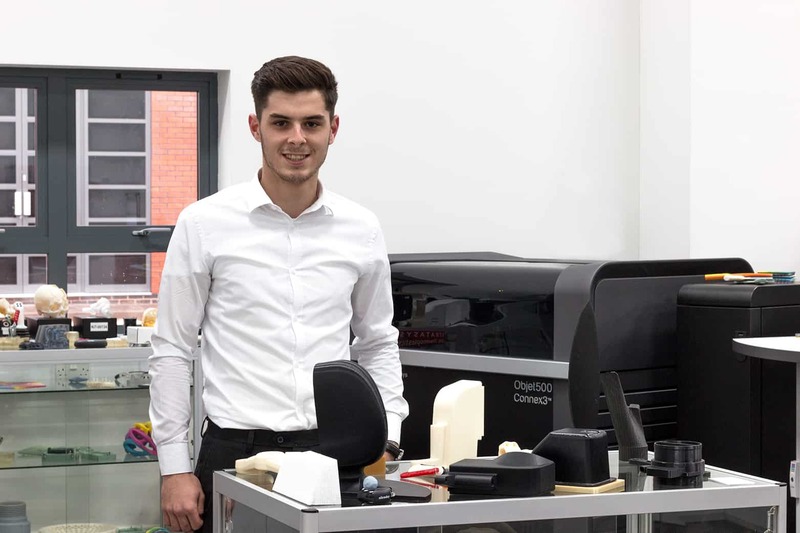 Charlie, 19, who lives in Melbourne and will train under 3D printing experts SYS Systems, is the latest beneficiary of an initiative between the Carfulan Group and JCB Academy. Three other apprentices are now 12 months into a three-year specialised programme which is designed to develop their formal engineering knowledge and skills. They must attend JCB for two of those to acquire general engineering certification, with an additional bolt-on year following their initial training giving them an NVQ qualification. Charlie said: “3D printing is an area I’m really interested in and I’m keen to find out a lot more about it. “I’ve really enjoyed it so far, it’s nice to get hands-on. I’m just focusing on learning all I can about the machines and progressing forward in my career. Working alongside experienced professionals, apprentices are gaining invaluable knowledge on health and safety, advanced mathematics, computer-aided design (CAD) software techniques and machine installation and calibration. Andrew Fulton, Managing Director and founder of the Carfulan Group, took the apprenticeship route out of school himself and is a big believer in its merits. He said: “Derbyshire is a globally recognised hub for manufacturing and, working with JCB and its top-class facilities, we’re only too happy to be able to invest in local talent and help nurture the next generation of engineers. “Our highly motivated young apprentices have made such a positive contribution to our operations in the past year and, thanks to hands-on learning in real-world scenarios, it’s been a pleasure to watch their confidence and skills grow. The plan is for Charlie to go on to work for SYS, with the other apprentices earmarked for careers with OGP and ZOLLER. The Carfulan Group has a long track record of success when it comes to apprenticeships. OGP UK Service Engineer Steven Fowkes began his career with the firm almost two decades ago and his son, Jamie, is now training there as a service engineer.